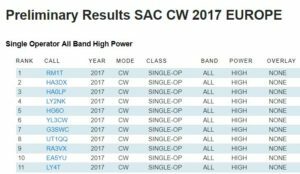 The SAC 2017 CW preliminary results are ready. Please check your score and UBN! Click on your call to see the UBN result. If you find that something is wrong, please e-mail us: support@sactest.net.